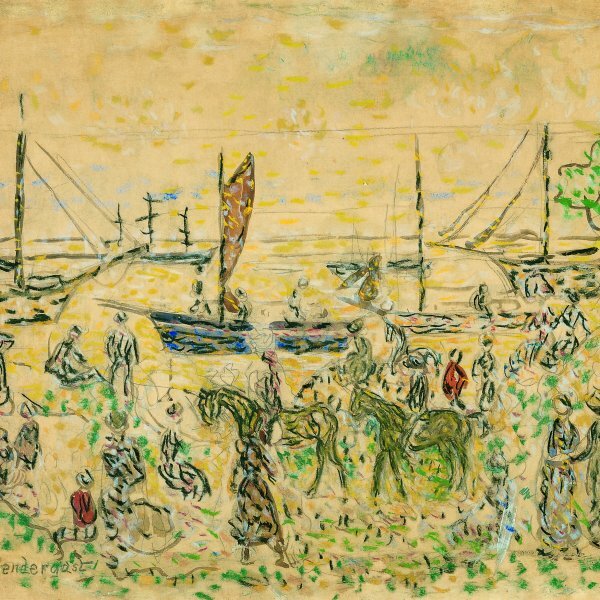 Although Prendergast was aware of Cézanne's work as early as 1898-1899, it was during his sojourn to Europe in 1907 that he received a new impulse from the French. "I was somewhat bewildered when I first got over here, " he wrote, "but I think Cézanne will influence me more than the others." He noted that Cézanne "gets the most wonderful color, a dusty kind of a grey" and that he leaves "everything to the imagination. They were great for their simplicity and suggestive qualities." In Still Life with Apples, Prendergast's debt to Cézanne can be seen in the tilting of the table top, the varied perspectives, the modeling through color rather than tone, the more subdued colouring, and in the suggestive handling of forms. It lacks, however, the subtle structures and tensions of the French master, as Prendergast's still life objects adhere to a flattened, tapestry-like spreading of shapes across the surface of his composition. The broad flat pattern of the leaves of his potted geranium he may have learned from Matisse. Drawings in his sketchbook of Matisse's Goldfish and Sculpture, 1911, New York, Museum of Modern Art, and Nasturtiums in front of "Dance", second version, 1912, New York, Metropolitan Museum of Art, were undoubtedly made when the works were displayed at the Armory Show in 1913. Prendergast painted at least fourteen still lifes with apples, five of which contain potted plants, which have now been dated between c. 1910-1913. 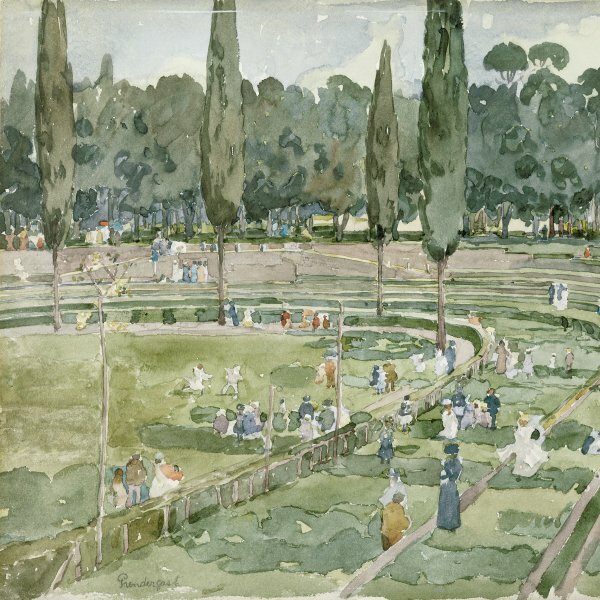 When Prendergast visited William Glackens and his wife in 1912, he spontaneously painted an en plein air study of green apples against their green lawn (Apples and a Pear on the Grass, 1912, Fort Lauderdale, FL, Museum of Art), successfully resolving what was considered a difficult aesthetic challenge in a canvas which he presented to the Glackens. Richard J. Wattenmaker has suggested that the artist might have turned to still lifes at this time during his recuperation from his illness in Venice. The decorative blue and white pots in Prendergast's still life may be the "two beautiful old Persian pottery jars in which they kept a few scraps of old brocade" which the son of William Glackens observed in the 50 Washington Square studio that Maurice and Charles Prendergast moved to in 1914. Later the "blue Persian pot" was relegated to more a more utilitarian purpose as Walter Pach observed it "held the paint-brushes for so many years in his studio." 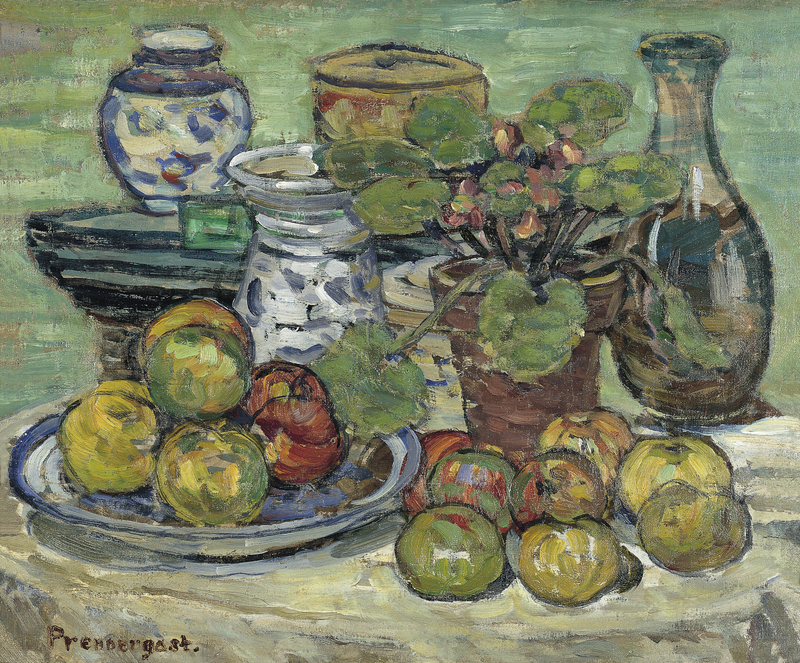 Other elements in Prendergast's still life are the common objects associated with the genre, rather than the more exotic bric-a-brac that Maurice collected with his brother in his studio. Nancy Mowll Mathews has pointed out that Prendergast and many of the other American modernists found in the mundane materials that Cézanne assembled for his still lifes, a deeper spirituality. In "Extracts from 'The Spiritual in Art, '" which was published in Camera Work in 1912, influencing many American artists, Wassily Kandinsky wrote that Cézanne "raised 'nature morte' (still life) to that height where the outer dead things become essentially living" and that he "was gifted with the power of seeing the inner life of everything." The frame for Still Life with Apples was made by the artist's brother, Charles.